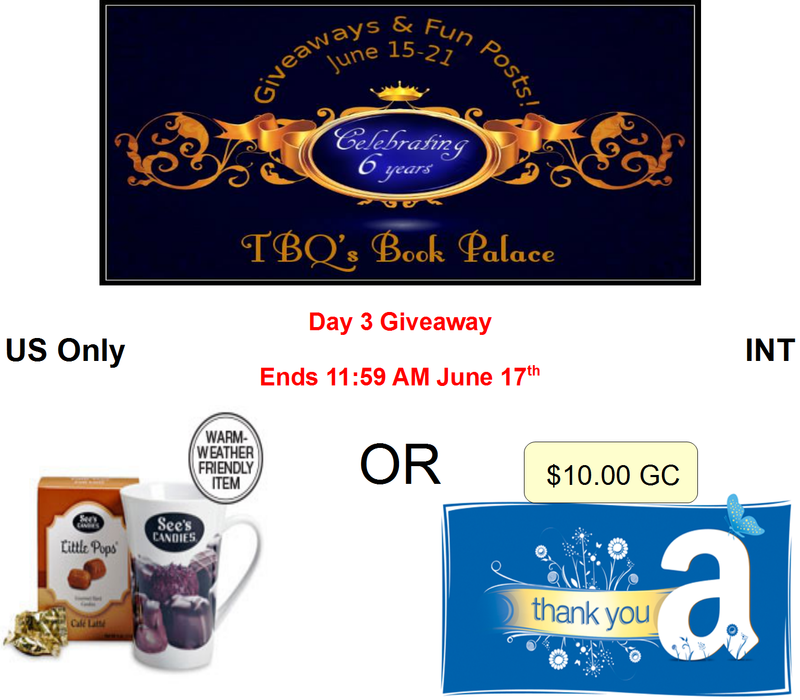 TBQ'S Book Palace: Six Year Blogoversary: Day 3 + Giveaway! Six Year Blogoversary: Day 3 + Giveaway! 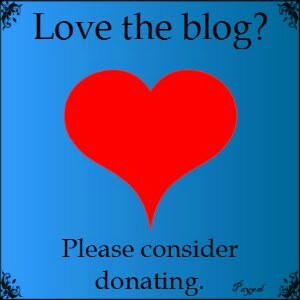 Starting June 15th, we will be celebrating the blog's 6 year blogoversary with fun posts and giveaways. The party will end June 21st. Check back each day for a new post and giveaway. The daily giveaways will each last 24 hours, and all winners will be picked and announced on the 22nd! I will also be running a grand prize giveaway (one for US residents and one for INT readers). These giveaways can be found HERE, and it will run until June 21st, with the winner also being announced the following day. Good luck and have fun! 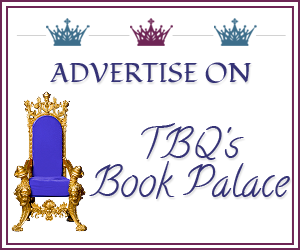 TBQ's Book Palace: The Early Years! I've learned a lot over the years, and I continue to do so. When I look back at my early posts, I cringe a bit. Part of it is the wonky formatting, which I haven't yet had the spare time (ha!) to manually update to look like the current posts. Part of it is my writing style, which has changed over the years. For the best, I hope. So what was my first review on the blog? What book started it all for me – blogging-wise, at least? I raved and gushed about my love of Jamie (insert dreamy sigh here!) giving the book 5 stars. I loved this book, but here's the sad truth: due to my massive TBR pile and the general lack of time in each day, six years later I still have not read the rest of the series. Wait, other than book 2. If you dare, look back at my first review. It is the lone “early years” review that I have updated the general format on, but I haven't messed with my actual review. So if you spot any spelling errors or find yourself wondering why I ramble so much, I'm sorry! What was your first review, be it on Amazon, GR – or hell, even an in-depth recommendation to a friend, in person or online! I've shown you mine, now it's your turn! Giveaway ends June 17th at 11:59 AM. Winner will be picked and announced at the end of the blogoversary -- June 22nd. If the winner is from the US, they will receive the See's Candies Coffee Mug and Little Pops. If they are INT, they will receive a $10 gift card to Amazon instead. This giveaway will only run 24 hours. All winners will be announced and contacted on June 22nd, when the blogoversary is over. Remember, the GRAND PRIZE Giveaways ends June 21st though, so there is plenty of time to enter that one. Good luck! Question: What was the first review YOU wrote? Or do you recall the first review you read (not necessarily here!) that made you want to buy a book? Hehe --- and this is one of the many reasons we get along so well! I confess, I'm that way as well. I don't read nearly enough reviews before adding a book to my shelf. But, if the book is more than $1.99, I find that I do a bit more research before buying. I'm cheap like that! One of the first reviews I read was for Lisa Marie Rice's "Dangerous Lover" and I immediately went to check out her books. I have been reading for SO long that I honestly can't remember the first review I read. I will say that I pay attention to reviews before buying. :) I'm guilty of not doing so at times, but other times I spend hours trying to decide if a book is worth it. Usually if it's more expensive or a new to me author. I don't remember my first review. Its been so long. I don't recall the first book I bought because of a review. I have a hard enough time remembering what I did yesterday. I wish I could remember one. I've been reading for some many years now that I don't always remember where I hear about a book. Bwaha yes those first reviews were...something else. lol I try not to look too often. Mine have the same formatting change. I'm slowly going back and updating to the current but holy cow it takes a long while. My first on the blog were a couple mini-reviews for Rachel Caine's Morganville Vamps series. And yup. That "they're on my tbr pile" bit happened to me too. I have half the series yet to go. Whew! It's true -- so many books, so little time . . . It's easy for titles and whatnot to get lost in the shuffle! Oh, I try to forget them. If I was to look back at some of them . . . I'd probably run and hide and stop reviewing! lol Oh, I loved Caine's MV series! I didn't review Outlander for the blog, but lord yes, I'd have quite a ramble about Jamie love too if I did. I'm still working through the Lord John series that is a spin-off and I didn't grab up the latest yet. I have tons still sitting on the wish list from series I've started and haven't gone back to. Hmm, my first review for the blog was The Rancher and the Rockstar by Liz Selvig. I remember being super nervous and was so thrilled when people commented including the author to say thanks. I can't remember my very first review ever, but it was definitely for Amazon. It was like five sentences. Anyone who knows me, knows that five sentences is like the intro of my review. Haha!